In preparation for The Olde Farmhouse vintage market, I’ve been playing with the old fence wood I collected a while back. Remember the lottery win post HERE? First I needed to find it a home. So I built a wood cart to go underneath an ugly fold out turned cool farmhouse style table. And then that wood had to be cleaned. There was so much mould on it, I thought I’d have to throw most of it out. But… not a one needed to go. 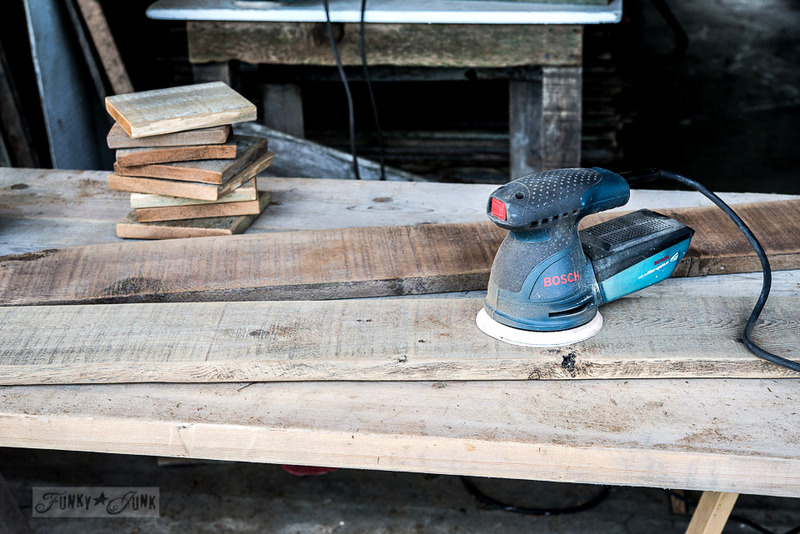 THIS proved to be the easiest way to clean reclaimed wood! Then I was left with a pretty sweet cleaned up haul that was itchin’ to become so much more than planks from a falling down fence. After cleaning, the boards got a super good sanding. Then it was time to play. And a reclaimed fence wood drill handled toolbox was the result. The one on the right is new. The one on the left was my first try at it many moons ago, which I used as inspiration for size. How to build a drill handled toolbox is HERE. But, let’s look a little closer, because I have a few secrets to share with this new (old?) design. Doesn’t this old relic look like it’s 100 years old? This round, I angled the toolbox sides, but ensured the top edges were left original. To further celebrate the old wood, imperfections were given centre stage. To hold the drill handle in place, a rusty bracket of sorts was screwed right above the handle. That’s really the trick to something looking authentically old… just use old stuff when you build. And then… temptation got the better of me. 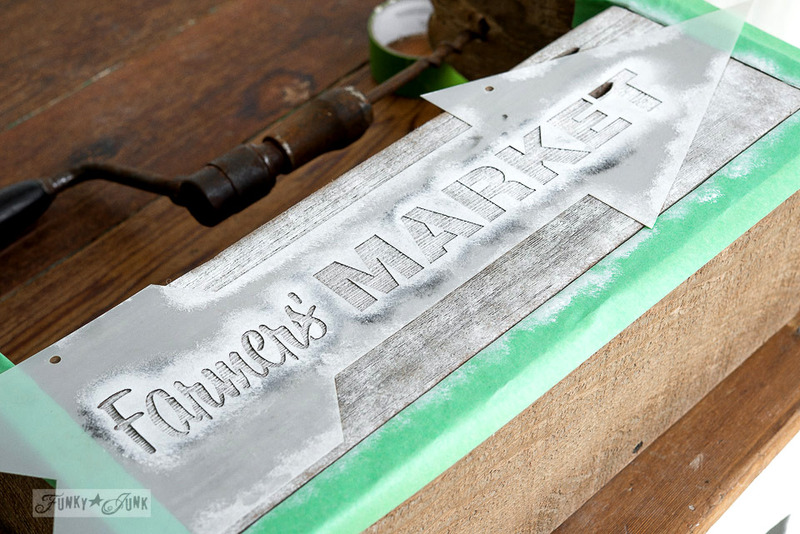 The Farmers’ Market arrow stencil (* small kit is no longer sold, just Farmers’ Market large is avail* ) was used, but with a twist. See where the arrow jogs out wider after Farmers’? I just slid the stencil to the left to fill in that area so the arrow would be straight. 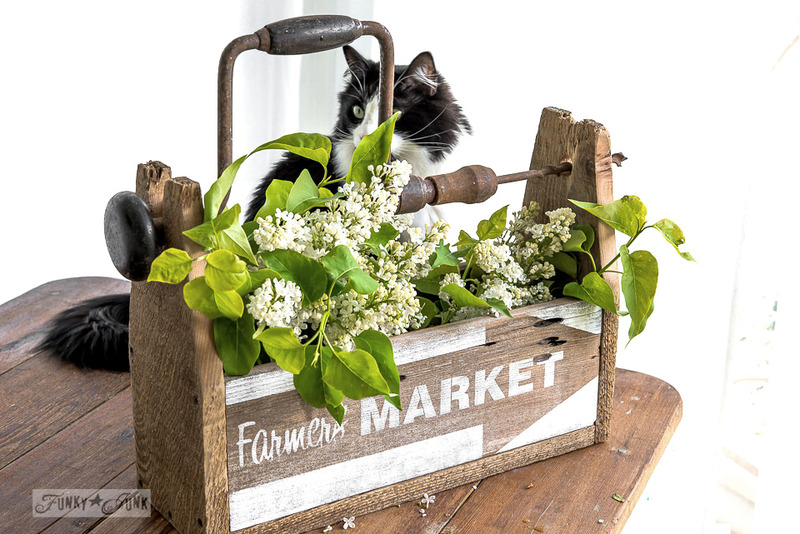 Well, I mean, everything goes better with lilacs and cats! So yes! 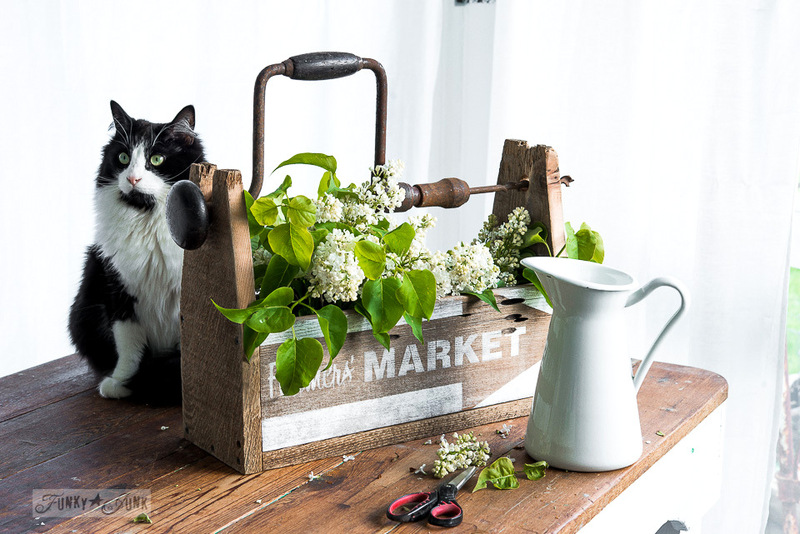 The toolbox makes a great rustic vase. Tuck water filled jars inside and just add cut flowers from the yard. But how about something a little more productive? A glorified office pen holder! You could store files if you built the box long enough like I did with my shutter toolbox. 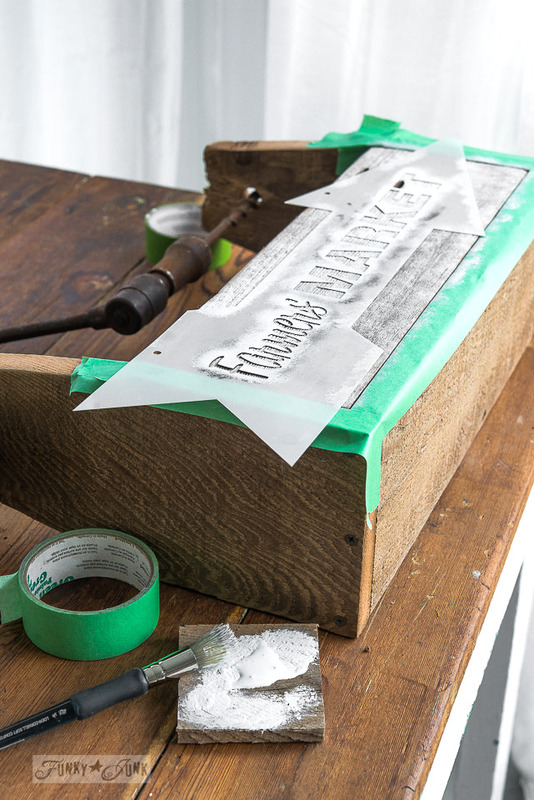 The stencil was intentionally cut off here and there, to resemble the toolbox being made out of a wood sign. The design wasn’t further distressed, to encourage the white to pop as much as possible. That WOOD! Isn’t it pretty? Now we’re talkin’! All my paintbrushes were a perfect fit. 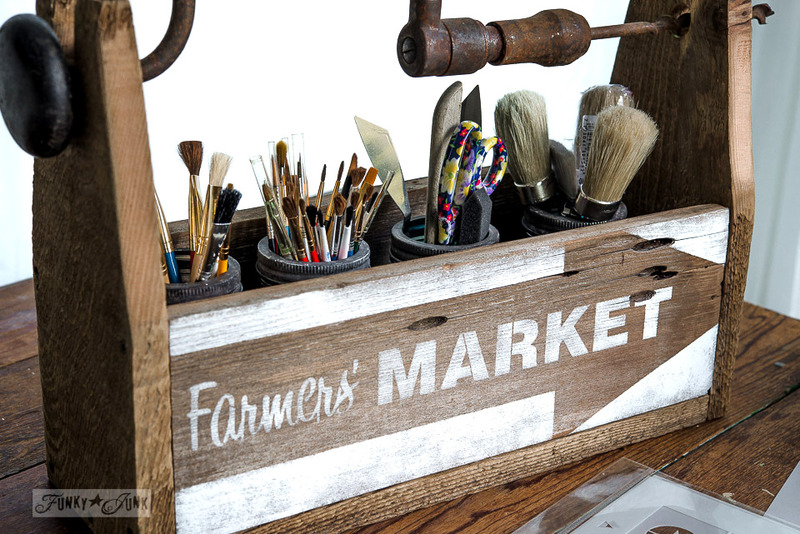 And boy did this drill handled toolbox of many talents look good in front of the mattress spring stencil holder in the paint studio. What do you think Skye? Is the toolbox a keeper? Bah! She’s a wise one. Show time comes first. I guess I’ll just have to make another. For myself and the show. I’m going to bring some plain so they can be decorated up as desired by their new owners. Donna, your projects are so interesting and inspirational. Thanks! Oh, Donna! 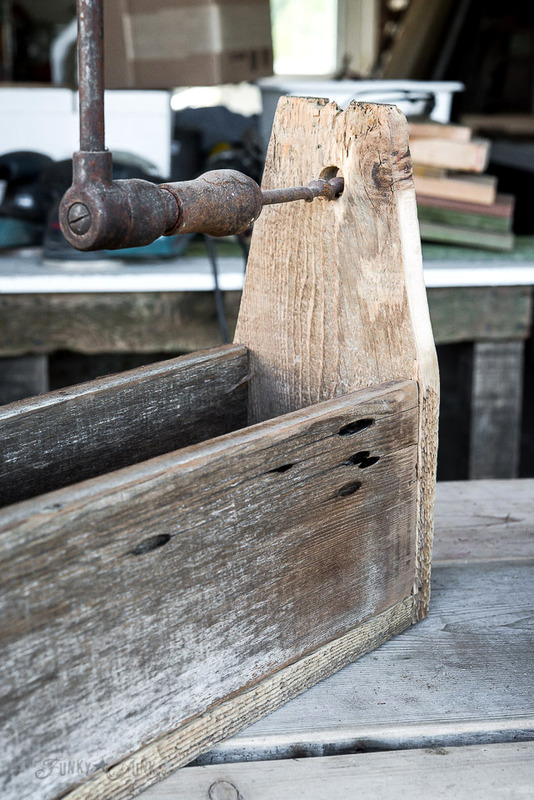 I think we may have my Dad’s old hand drill in storage … at least I sure hope so! What a treasure it would be to have a box like this made with his ~ how special! Hmmm … Can I just say, I’d like to live in your head for a day!!!? Very beautiful, i like that and i want the same !!!! Have fun in Vegas, it’s a hoot! I cannot thank you enough for using the proper plural possessive punctuation on farmers’. 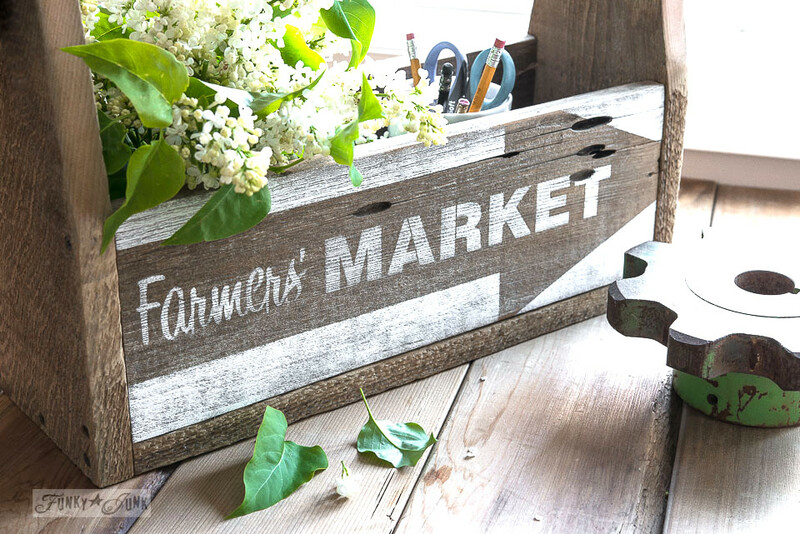 Perhaps it’s just a “thing” in the USA but I am involved with our local farmers’ market and do quite a bit of research into other markets and the norm is to not use the apostrophe or to use it incorrectly (farmer’s). Despite all that- what a great piece! I’m sorry, but I would use a different handle and use the “BRACE and BIT” as it was intended. 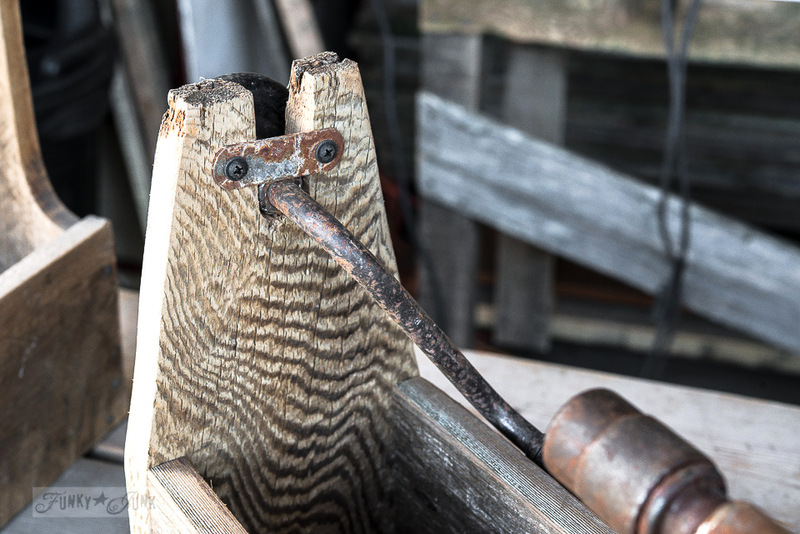 I love old tools and if they still work, I clean them up and make repairs as needed. Then take them to the shop and use them in what ever project I’m working on. That’s fabulous, Tom! I like hearing how all the old relics are still being used! The nice thing with this project is, the brace and bit is left intact and easy to lift out. Plus it gets appreciated in a new way from someone who doesn’t wish to woodwork with it. Donna – I just love your creations! We just bought some beautiful garden art this weekend from my landscaper. She just opened her own store selling all kinds of items (repurposed and otherwise) – oh the rusty treasures she had. I was junk drunk. 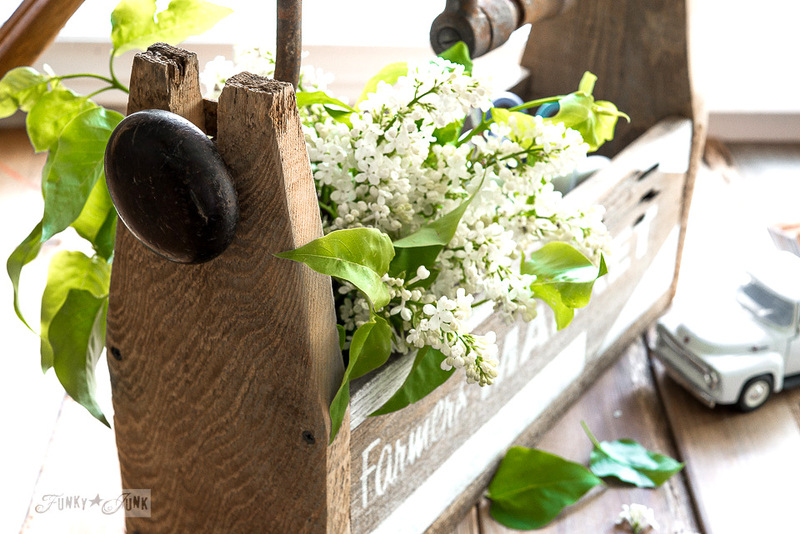 I saw some beautiful potting benches her husband had made from old barnwood – I was drooling. 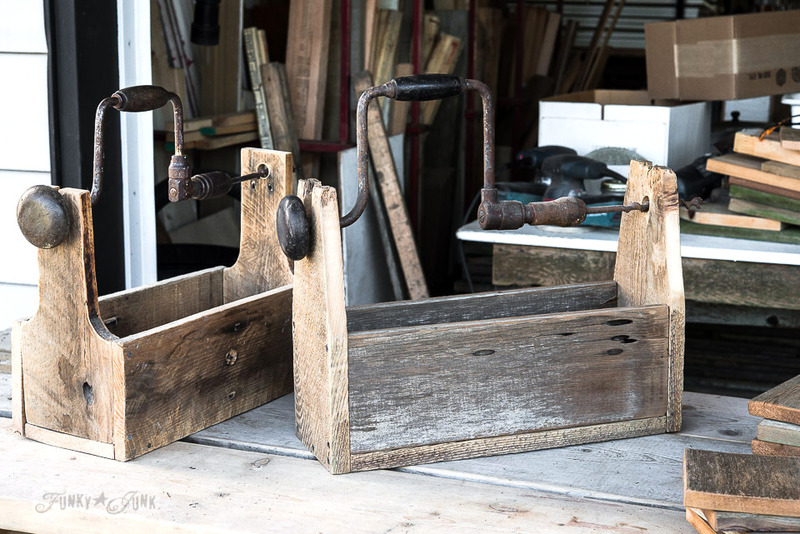 A lot of the items made me think of your creations – old, rusty and gorgeous! This summer I’m going to attempt to make one of your toolbox creations, I’ll let you know how it comes out. Thanks again for the inspiration. I love your drill handle toolboxes – they are my favorite. 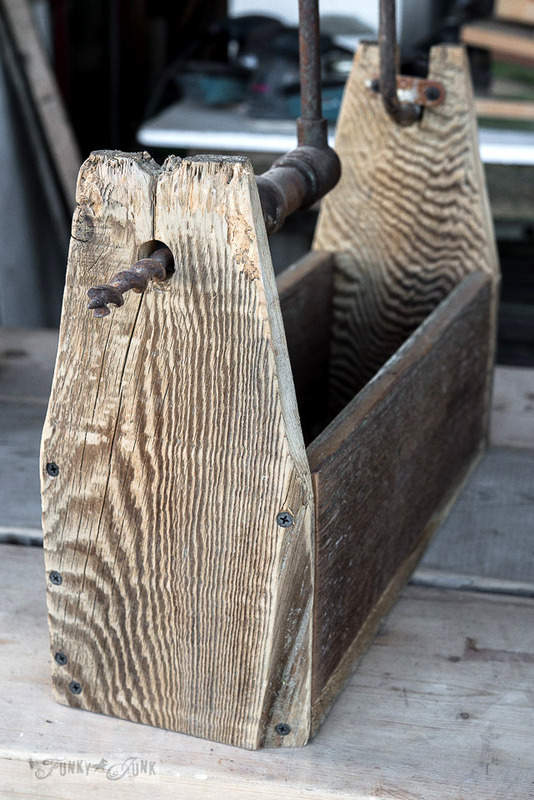 I wondered how you secured the drill handles – well that’s easy! Happy travels and all the best at both events Donna. Thanks Marie! This is actually the first handle I’ve attempted securing. The others were jammed into place and somewhat stayed ok if you didn’t drill the slots for them too big. This did work better! I love it! What a clever twist on one of your fabulous stencils. Love your stencil display too! Wonderful piece! 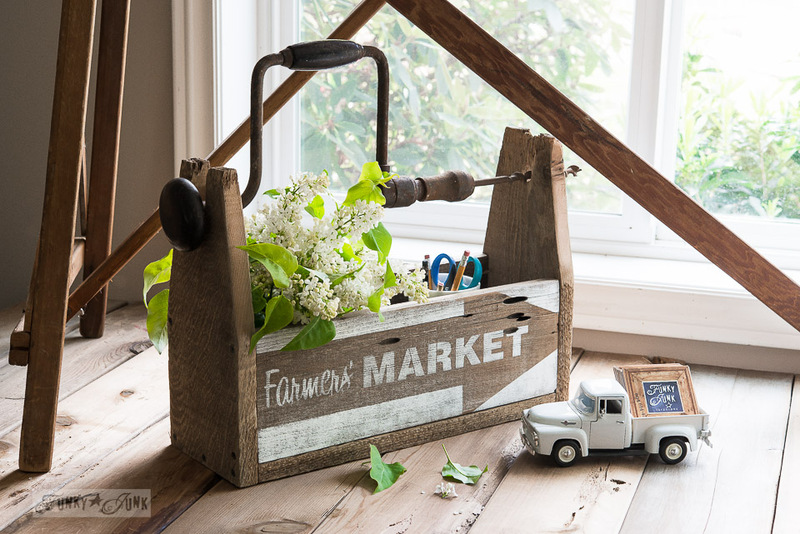 This would fit nicely in my craft room to hold the more sturdy tools that I use such as tile nippers, wire cutters, pliers etc…I hope you sell a ton of them, they are very versatile in their use, would be a great father’s day gift…..have fun on your upcoming travels! 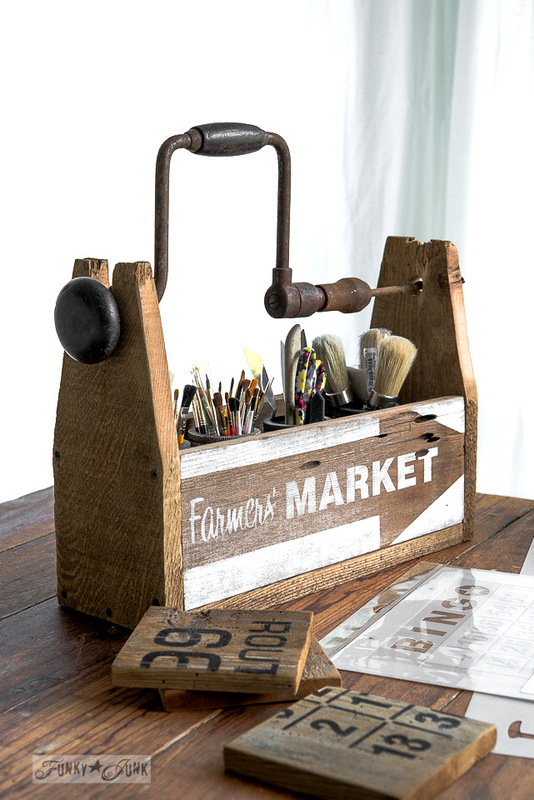 Absolutely lurve this…it’s my favourite of your tool boxes and that is saying something cuz I love ’em all! That fencing sure makes for beautiful wood to work with, doesn’t it? 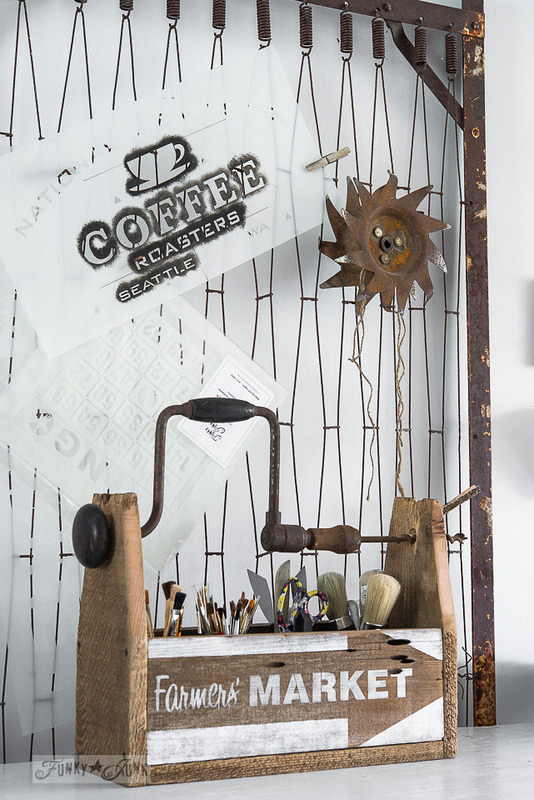 And your stencil just hits it right out of the park…sheer perfection! I think you’ll have a blast in Vegas…it’s soooooo much fun, a fun-loving soul like you would really appreciate it! I’ve never been to Salt Lake City, but I hear it’s quite nice…I hope you have a wonderful time there, as well! And also hope you will share more about your trips in upcoming posts! Susan, try and keep me quiet! Won’t happen! haha I’ll for SURE share my adventures with all of you! hi Donna … love your toolbox and your stencils are just wonderful. Do you know why Skye is hanging around? Look at your sixth picture down in your post. When I first looked at the picture I thought you’d made an owl on the end post!! Then I wondered what kind of owl had a long beak like that. Haha! But Skye is entertained! Yes, I’m very grateful to live in the Bahamas of Canada. We get SO much rain though. It’s been raining for days on end. Looking forward to seeing a little sunshine on Tuesday! I wish you the best while you’re on the road! Enjoy! I love this project and the reclaimed wood is fabulous. This definitely a lottery wind when you found this wood. Do you have a stash of the drills? I have got to add this to my to do list. 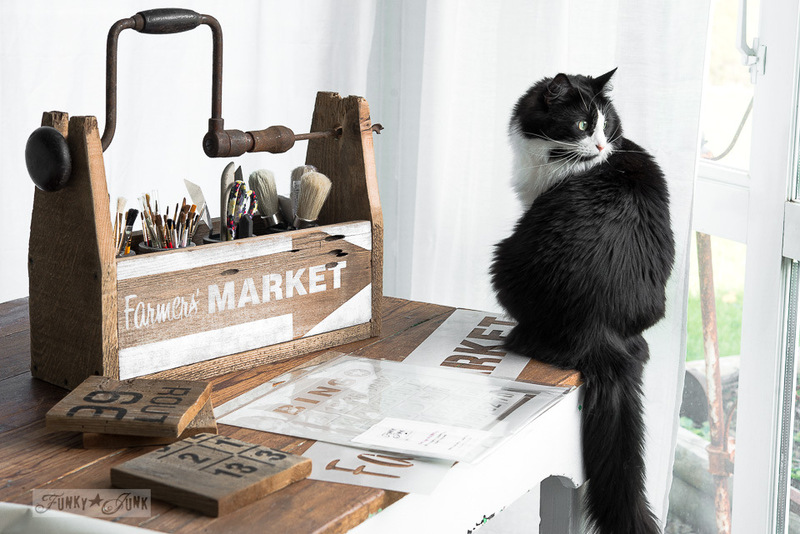 I love the stencil you used on this project! It is so fun to see all your creations using your awesome find of fence wood! Excited to see more!